The All-America Football Conference’s Chicago franchise had undergone significant alteration coming into the 1949 season. The league had installed new ownership and the nickname was changed from Rockets to Hornets. Ray Flaherty was brought in to coach the team, and he had experienced success with the NFL Redskins and AAFC Yankees. Most importantly, there were many new players on the roster, including ten alone who had come from the defunct Brooklyn Dodgers. For a team that was coming off a miserable 1-13 record, it could only be an improvement. The Hornets opened the regular season on August 26 against the Buffalo Bills. The Bills had nearly been sold and relocated to Houston in the offseason, but strong community support kept the team in place. Head Coach Red Dawson’s club was coming off a 7-7 campaign in ’48 that was good enough to tie for first place in the mediocre Eastern Division and had advanced to the league title game, only to be pummeled by the mighty Cleveland Browns. QB George Ratterman had skillfully guided the productive offense, but he was holding out in a salary dispute and was thus unavailable for the first game of the new season. Untested backup QB Jim Still started in his place. There were 23,800 in attendance at Soldier Field for the Friday night game. 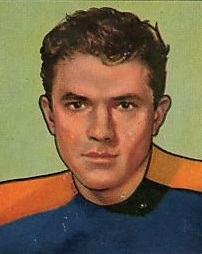 The Hornets unveiled a single-wing attack, taking advantage of the presence of tailbacks Bob “Hunchy” Hoernschmeyer (pictured at top), who was returning to the team after a hiatus with the Dodgers; Johnny Clement, formerly of the NFL Steelers; and Bob Chappuis, another Brooklyn refugee. It was the Bills getting on the board first on a touchdown pass from Jim Still to end Al Baldwin that covered 18 yards. Not only did it put the visitors ahead by 7-0 after Chet Adams added the extra point, but it marked an AAFC-record seventh straight game, stretching back to the previous season, in which Baldwin (pictured below) had scored a TD. The Hornets scored twice in the second quarter on big plays to take the lead. Bob Hoernschemeyer passed to wingback Ray Ramsey on a play that covered 63 yards for a touchdown. Johnny Clement then connected with wingback Paul Patterson for a 35-yard TD. With both PATs successfully added, Chicago led at halftime by a 14-7 tally. Neither club scored during the third quarter. Buffalo had difficulty moving on offense while the Hornets proved to be adept at turning the ball over. The Bills got a break in the fourth quarter when a bad snap on a punt gave them possession on the Chicago 38. The series culminated in a 13-yard run by HB Chet Mutryn that, with the successful extra point, tied the score. Late in the fourth quarter the Hornets had the ball in scoring territory and Jim McCarthy booted a 21-yard field goal that broke the deadlock. Chicago held on to win by a final tally of 17-14. The Hornets significantly outgained Buffalo (305 yards to 193), with the Bills only able to generate 66 yards through the air. The visitors had the edge in first downs (9 to 7) and Chicago turned the ball over six times (two interceptions and four fumbles) to three suffered by Buffalo. It was an encouraging – if sloppy – start for the Hornets, who were thrashed by the 49ers the following week but won their next two and had a 4-3 record before the bottom fell out. They lost their remaining games and ended up at 4-8, tying them for fifth in the division-less AAFC with the Los Angeles Dons. Bob Hoernschmeyer and Johnny Clement continued to handle the bulk of the playing time at tailback. Hoernschmeyer threw more passes (167 to 114) for more yards (1063 to 906) but Clement was more accurate (50.9 to 41.3). Each passed for six touchdowns. Hoernschmeyer also led the team in rushing with 456 yards, with Clement next at 388. Buffalo had George Ratterman back in the fold in short order and, after getting off to a 1-4-1 start that cost Coach Ramsey his job, finished strong. The Bills ended up with a 5-5-2 record that placed them fourth and gave them a spot in the playoffs. They lost to the Browns in the first round. 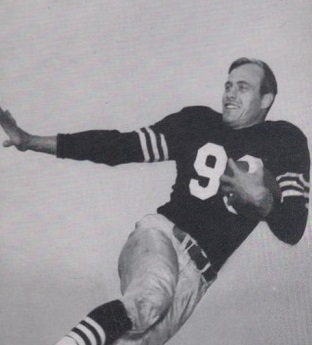 Al Baldwin’s streak of games with touchdown receptions ended the week following the opening game. He ranked second for the year in the AAFC with 53 pass receptions, 719 yards, and 7 scoring catches (tied with Dante Lavelli and Mac Speedie of the Browns).